Romain Grosjean set the pace for Lotus as the final day of the second pre-season test was overshadowed by a nasty accident involving Fernando Alonso. The McLaren driver was taken to hospital after a crash on the exit of Turn Three, but was uninjured. 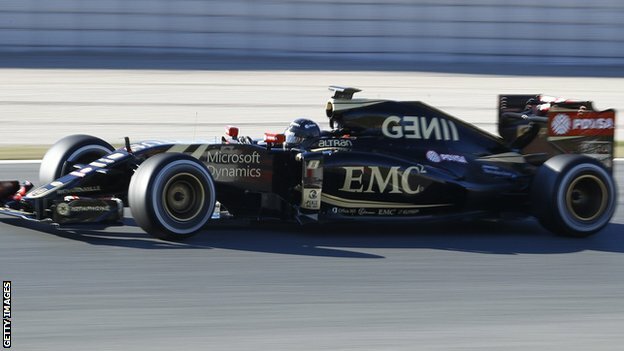 Grosjean’s speed suggested Lotus may be on for a revival after slipping to near the back last year. But Nico Rosberg underlined Mercedes’s status as the team to beat by setting second fastest time on a slower tyre. Grosjean’s time of one minute 24.067 seconds was the fastest of the four-day test, but it was set on the super-soft tyre. Rosberg was only 0.254secs slower using the medium, two grades softer and reckoned by tyre supplier Pirelli to be as much as two seconds slower. And Rosberg’s lap was 0.1secs faster than the one Grosjean achieved previously on the ‘soft’ tyre, itself reckoned by teams to be at least a second quicker than the medium. The next fastest driver on mediums was Ferrari’s Sebastian Vettel, who was a massive 1.991secs slower than Rosberg. However, it is impossible to compare the times directly as the amount of fuel each car has on board is not known, and 10kg of fuel – 10% of a tank – equates to 0.35secs a lap. Lotus were encouraged by their progress and trackside operations director Alan Permane said the drivers were complimentary about the car, and that it was better in all areas than last year’s. But he added that they had no idea where they stood in the competitive order. Red Bull’s Daniil Kvyat was third fastest from Sauber’s Felipe Nasr, Williams’s Valtteri Bottas and Toro Rosso driver Carlos Sainz Jr, who had a harmless spin into the gravel at Turn Three.